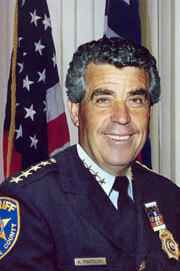 A career law enforcement officer, Fontoura was appointed Sheriff in 1990, elected in 1991 and re-elected in 1994, 1997, 2000, 2003, 2006, 2009 and 2012. He is the longest tenured Sheriff in Essex County history. A frequent newsmaker and guest expert on network and nationally syndicated television news and public affairs programs, Sheriff Fontoura has appeared on NBC’s “Dateline”, ABC’s “Prime Time” and CBS’s “48 Hours” and “Eye on America”. He hasprovided insight on topics ranging from terrorist bombings and the ban on assault weapons to gang violence and emergency management. He is a member of the Board of Directors or Advisory Board for The United Way, The Salvation Army, The Star-Ledger Christmas Fund, The 200 Club of Essex County, the Ironbound Boys’ and Girls’ Club and the Public Employees Charitable Campaign. Sheriff Fontoura’s annual Thanksgiving Food Drive for the Homeless and his Holiday Toy Drive for Needy Families donates bulk foodstuffs to scores of local social service pantries and gifts to thousands of children. Sheriff Fontoura is also a Governor for the Cathedral Health Care System.